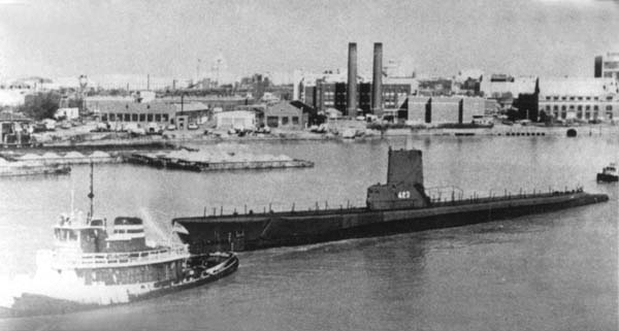 In June of 1968, Torsk was towed from Boston to the Navy Yard in Washington, DC, where she replaced USS Drum SS-212 as the Naval Reserve Training Submarine. As a Naval Reserve Trainer, Torsk provided training services to members of the US Navy Reserve unit stationed there. Although she never left the pier, the sailors could practice such skills as engine maintenance and operation, electrical and equipment maintenance, and other skills in a floating classroom setting. Torsk also was a popular tourist attraction at the Navy Yard in Washington, DC, hosting tours for Washington area school children, youth organizations, and other tour groups from all over the nation. In 1971, Torsk was deemed no longer necessary as a Naval Reserve Trainer. On February 8, 1972 she was towed away from her berth at the Washington Navy Yard to the Inactive Ship Facility in Norfolk, VA to a very uncertain future.